As a business owner, you’re used to wearing several hats. However, you don’t always have the time or expertise needed for those various roles. So what do you do when you need help but don’t have the resources to bring on a full-time team member? The answer could lie in temporary consulting. 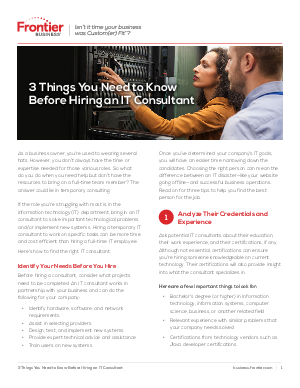 If the role you’re struggling with most is in the information technology (IT) department, bring in an IT consultant to solve important technological problems and/or implement new systems. Hiring a temporary IT consultant to work on specific tasks can be more time and cost efficient than hiring a full-time IT employee. Here’s how to find the right IT consultant.